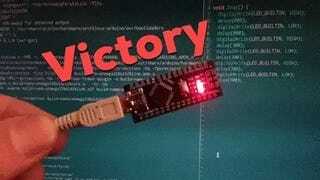 Yes, blinking an LED counts as victory in computerland. Don’t do computers, kids! I use the Arduino/AVR toolchain, but I prefer to do it outside of the official Arduino IDE because I need mah vim. As I expected, there have been changes to the official IDE’s internals that necessitated finding a new Makefile to do the compiling & uploading, but those changes happened a while ago so that wasn’t hard. The only tricky bit was figuring out exactly which board & bootloader settings I needed to choose for my cheap knockoff board. But all in all it was well under half an hour to get that sweet, sweet LED blinkage. Spend some quality time with the audio processing chip’s datasheet. Write some code to configure the audio processing chip to do nothing but encode the analog in to digital, in right-justified 16-bit I2S format (bypassing the signal processing functionality of the chip). The problem with this plan is that I don’t have a good way to test it out at the end. I do have a Salae logic analyzer, but I’m not sure whether it supports I2S. If it doesn’t, then I gotta go find someone who’ll let me use their oscilloscope (I don’t do this sort of thing enough to justify buying an oscilloscope). I hope to make progress on Stage Two this weekend. Stay tuned.